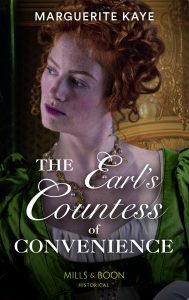 Sophia, the heroine of my April release, FROM COURTESAN TO CONVENIENT WIFE is, like me, a bit of a foodie. I love exploring food markets, sampling the stallholder’s wares and shopping for lunch. For me, a picnic at the airport or on the train with a bottle of bubbly is the ritual curtain-raiser to every holiday, and a picnic comprised of local goodies is de rigueur when I’m having a day out, rain, hail or snow – and it’s often all three, if you live in Argyll. In Paris, thanks to the amazing local fresh produce markets and artisan food shops, you can elevate the humble picnic to a whole new gastronomic level. In épiceries, you can purchase my favourite, pork rillettes, any number of patés and hams, salads such as remoulade of celeriac, stuffed artichokes and peppers – I’m drooling already! But you can also sample some seriously elegant food, such as layered seafood, fois gras or vegetable terrines, baked eggs wrapped in ham with truffle oil in aspic, delicate quiches, and myriad cheeses, obviously. In fact, if you didn’t want to go to any other shop, an épicerie could easily provide you with everything required for a moveable feast, including the wine. But the beauty of Paris is that the choice on offer is vast. The selection of bread in a boulangerie is mind-blowing. Fishmongers will sell you cooked crevettes and sauce, as well as a whole selection of different types of oysters. Bet you thought an oyster is an oyster. Not so, there are dozens, differentiated by where they are grown, from the Brittany coast on the Atlantic to the Mediterranean lagoons of the Camargue. There’s a restaurant near Les Halles I once visited where the six course menu consisted entirely of oysters prepared in different ways. The fishmonger will open them for you too, which I highly recommend – I still have the scar where my trusty Swiss Army knife shut on my finger while I struggled with a very stubborn oyster. 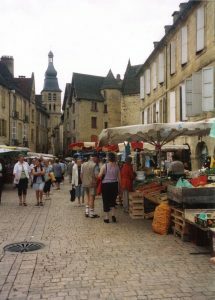 There are markets on every street corner where you can sample and buy, and greengrocers where you can source heritage tomatoes, perfectly ripe avocados (something that seems to be anathema in greengrocers here) raspberries and strawberries. As for wine, whatever your tipple of choice can be bought really cheaply in one of the many little supermarkets, and they will all have a chilled cabinet stocked with bubbly too. So, where are the best picnic spots in Paris? Too many to list! But here are some of my favourites. 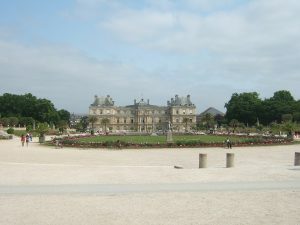 A fantastic park in any season, with loads of those very uncomfortable metal deck chairs around the boating pond with a view to the Palais Luxembourg. There are proper picnic tables dotted around the various coffee pavilions, but if you take your time – and why not, the perfect picnic deserves the perfect location – then you can find some secluded benches tucked away by the various fountains and mad topiary. From the gardens, it’s only a ten minute walk to the Rue de Grenelle in the Faubourg St Germain (near Rodin’s museum) where my hero, Jean-Luc’s hôtel particulier is located, a stroll I did myself the last time I was in Paris, and plotting his story. 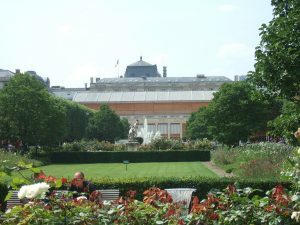 The gardens of the Palais Royal are the perfect spot for a summer picnic right in the heart of Paris. In the years after the Revolution, a number of chefs who had previously worked in the chateaus and town houses of the beheaded aristocrats established restaurants, and the Palais Royal colonnades were a popular location. 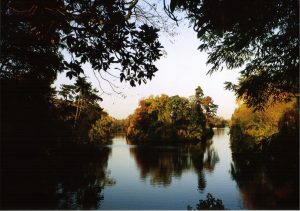 Chez Noudet, mentioned by Jean-Luc in my book, was one of the first. 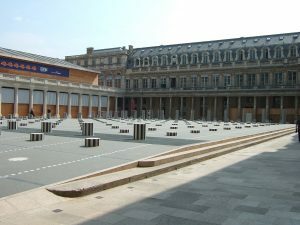 But the colonnades of the Palais Royal were also the stamping ground of the city’s ladies of the night, so dining out wasn’t an option for more genteel ladies such as my heroine, Sophia. As with every Paris park, there are loads of bottom-numbing metal deckchairs to be had, but the benches are far more comfortable, and there are lots of shady nooks and sweet-scented rose gardens with sparkling fountains to choose from. 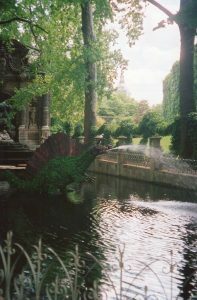 The Bois de Boulogne has always been the haunt of Parisian’s courtesans, showing off their latest toilette in their carriages while their poorer counterparts of the demi-monde paraded alongside. There are still, it has to be said, some very dodgy parts of this district, and the first time I picnicked there I was so unnerved I almost turned back to eat the selection of oysters I’d bought at the market elsewhere. But I persisted, and stumbled across this part of the park, haunt of very posh nannies with their charges. And as you can see, the autumnal colours were glorious. 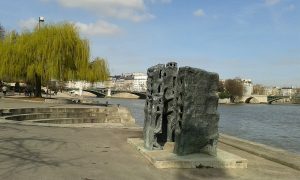 A quirky picnic spot on the Left Bank, with views of Notre Dame and the Ile Saint-Louis, it’s not so much a garden with plants, as a river bank with statues. The garden is on the Quai Saint-Bernard where the Halle aux Vins or wine warehouse was in Jean-Luc’s time. My hero and heroine have a close encounter in Jean-Luc’s office, and in the morning take a walk along the quay to the market at Les Halles – which I’ll be recreating in another blog coming soon. I could go on and on and on, but I’m just making myself hungry. So it’s over to you. Do you like to picnic? Where are your own personal favourite spots? Are you a sarnie and packet of crisps aficionado or do you favour a gourmet spread? 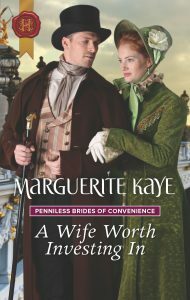 This entry was posted in Book News, Food and tagged From Courtesan to Convenient Wife, Paris. Bookmark the permalink. 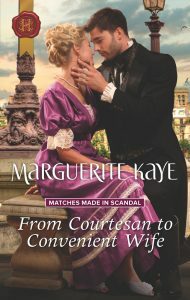 Just as when I read FROM COURTESAN TO CONVENIENT WIFE, this made me drool. The different oysters are amazing. I remember when our French neighbor brought us some green ones. We were skeptical at first but they were fresh and delicious. The markets! My husband worked across the street from our apartment, whereas I had to take the metro to work, so he came home for lunch and then headed to the market to pick up something fresh for dinner. When I say fresh, I mean FRESH! Fish with their eyes still bulging were proof! We loved nothing more than to grab a fresh baguette, sliced jambon and gruyere and head out to the environs of Paris on Sundays. We would visit an old church or chateau. Then, we would find a place for our lunch followed later on by a stop at a patisserie for my favorite – a Paris Brest and a coffee. The best day of the week! Paris and food. They just go together. You are making me so hungry Connie! When I was there last year, for the first time I had an apartment, right in the heart of St Germain. There was a market across the road, along with a fantastic fishmonger and epicerie. I loved shopping there so much, I ended up with far too much food but it was all so delicious, I couldn’t resist. And there is nothing so wonderful as following your nose to find a place for lunch out in the country, is there? I so envy you having spent such a long time actually living there, it’s a dream for me. Maybe one day. Lovely. This is making me drool. I remember being there in November for the oyster season, and being completely confused by the selection you could buy in the markets. I’ve never had the green ones, but I much prefer the small ones from Normandy to the bigger ones you get in the south.